I’ve had the pleasure of trying a fruit tart in more countries than I can remember, and every tart i’ve tried is fundamentally similar, but each region gives it their unique taste. Some are sweeter than others. Some pride themselves with a crispy crust that doesn’t let the filling take away from it’s flavor and texture, while others prize their tarts for the balance of sweet custard topped with tart fruits, in which the crust is just a vessel. Here’s my take of a fruit tart, keeping convenience in mind. Using ready to bake or ready made pie crusts cuts out a major step and gives you time to focus on the filling. It’s not that I havent made the crust from scratch before, I actually prefer making it from scratch, but sometimers we’re all short of time, and we still want to make something delicious, and a ready made crust only helps. The only part you really need to prepare or cook is the custard, and it’s very simple. Start of by heating the milk and vanilla in a sauce pan on a low flame, mixing occasionally. In a bowl whisk the eggs and 1/2 cup sugar. Once bubbles start forming around the edges of the milk turn off the heat. Pour 1/2 cup of the warm milk into the eggs, whisking constantly. Once the eggs are completely whisked with the milk, pour the eggs into the milk and cook on a low flame until thickened, stirring constantly. In a small bowl mix the cornflour, cream and yellow food color and add to the custard, whisking constantly so no lumps form. Strain the custard before filling the tart shells. Divide the custard evenly into the mini pie crusts, or in one big one. Next, top with some whipped cream (you can use cool whipe as well). Top the whipped cream with an assortment of fresh fruit of your choice. I prefer using berries and kiwis. Refrigerate loosely covered with plastic wrap until you’re ready to serve. If you’re making these ahead of time, you can add the fruit right before serving so it stays fresh. You can also use the custard in other pie crusts such as a sugar cookie crust. 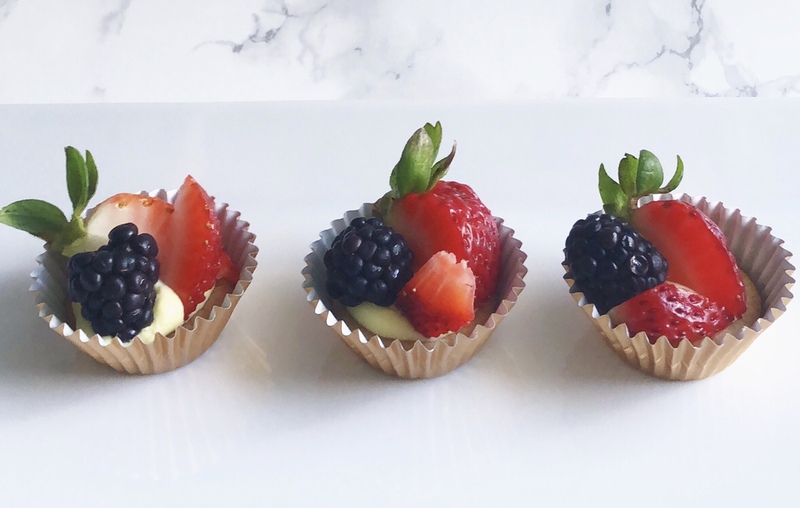 Bake them in cupcakes liners and add the same fillings for a slightly sweeter fruit tart.